Wow. 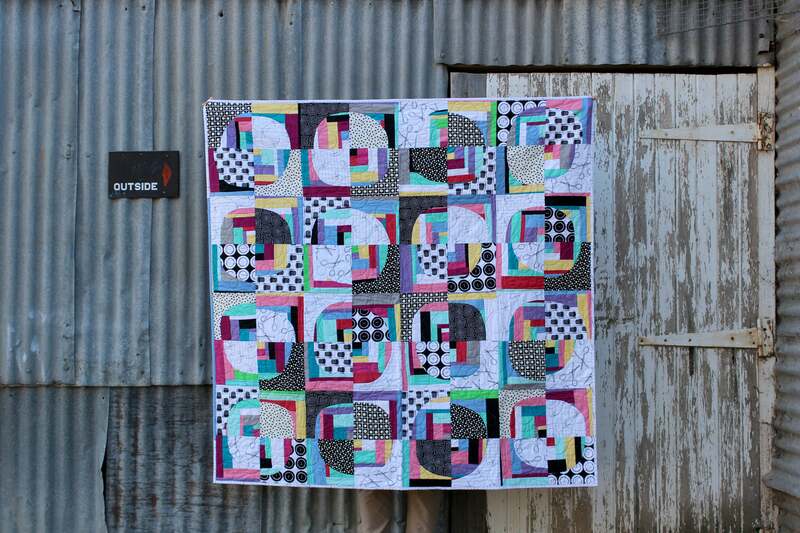 I can’t tell you just how thrilled I am about releasing my Modern Medallion quilt. I could not be prouder that I designed every detail and sewed every last stitch. And, what’s even greater is that I have drafted a pattern so you can make your very own Modern Medallion quilt too! 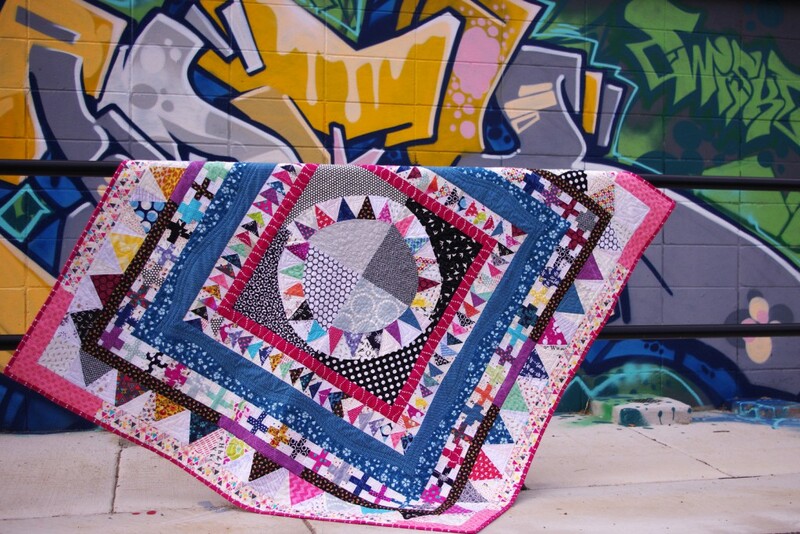 Download the Modern Medallion quilt pattern from theRaspberry Spool online shop today! I can’t say for sure where the idea for creating the Modern Medallion came from. It just sort of, appeared. I’ve said it before, creativity breeds creativity and it is certainly true for me. I finally found the perfect notebook to keep all my ideas. It’s pink, it has graph paper and it’s perfect. I carry it everywhere and when inspiration strikes, I can quickly and easily sketch my ideas so I will never lose them. I have always loved the New York Beauty block. It is such a striking block and the name sounds so romantic to me, conjuring up images from the 1920’s – How very Great Gatsby! Even with all this swooning over them, but with all those precise points, I just wasn’t up for it. When I saw Sarah Fielke’s deconstructed New York Beauty block a light bulb went off for me. That’s when I realised that it didn’t need to be perfect. This is modern quilting after all! After much trial and error, I came up with a way to make these precise points imprecisely (say that three times fast!) by going back to the original technique of foundation piecing. I came up with a technique that worked for me (which I am calling free foundation piecing), which really works for me and I was able to get just the look I wanted. You want bigger points? Just make them bigger! You want more points? Just draw them in. Simples! Once I had settled on the final design, I needed to decide on fabric. Should I use a range? I had some Tula Pink calling me, but I resisted and started pulling from my stash. You know, apart from one or two, I just wasn’t happy. My stash just couldn’t stretch to where I needed it to. While I was on holidays at my parents house in Perth, I had a lucky break. I found a shop which had the start of what I needed. Lots of lovely low volumes. Archie was a great help, climbing up the bolts of fabrics and generally being a pest while my mum tried her best to wrangle him. I was far too busy, pulling bolts down like a kid in a candy store (I was pretty embarrassing!). I have been planning this quilts for months and I finally took the plunge to actually make it. Through much trial and error, trials, frustrations, successes and perseverance I made it. I actually made it. I really need to make special mention of Jules from Procrasticraft. Whenever I doubted myself, she told me – You’ve got this. Her faith in me got me through. So Jules, thank you. This Modern Medallion uses many modern techniques, including improvisation, wonky piecing and free hand curves. 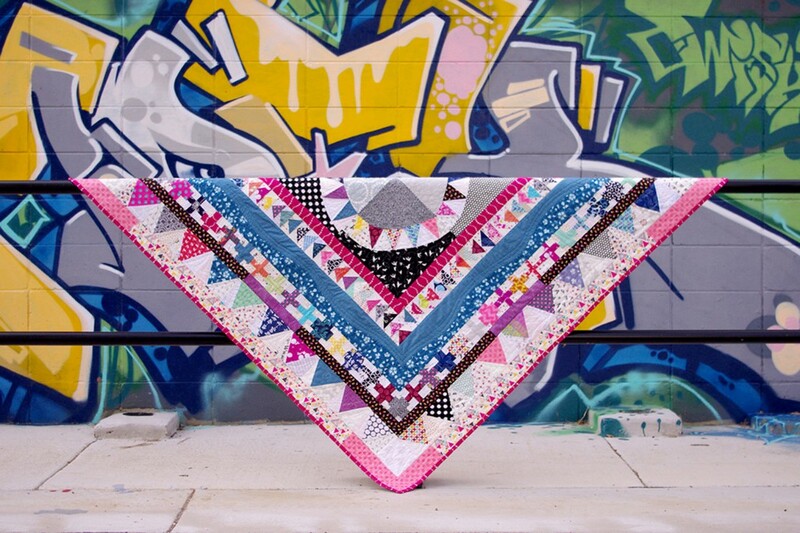 I combined some of my favourite blocks – starting with the new york beauty, flying geese, wavy curves, crosses and equilateral triangles, all with a modern makeover. Various bright colours and prints are set against a low volume background in this original design. This was my first time working with low volume prints and now I’m addicted! I have also posted a tutorial for the wavy border, if you are looking for a little extra guidance on that border. I am really excited to releasing the Modern Medallion quilt pattern. I love the different colour combinations and style choices that others have made. I can’t wait to see more! The Modern Medallion quilt – isn’t it glorious? Close up of the quilting – love that wavy border! 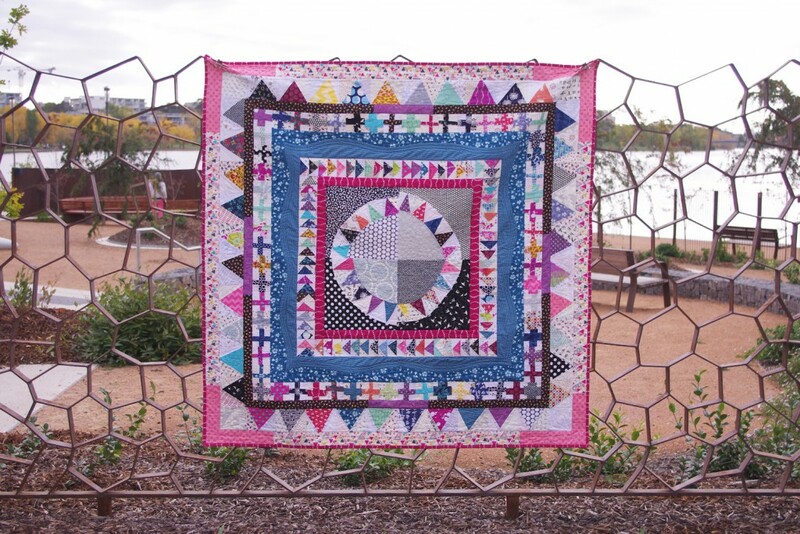 Download the Modern Medallion quilt pattern from the Raspberry Spool online shop today! I love your Medallion quilt!! Beautiful colours and fun fabrics. Love it! Well done for making your own pattern and having the faith to believe in yourself (and having someone there who had faith for both of you when you stumbled). I’m very much looking forward to making my own during the hop! Well done! I would be delighted if you joined us! 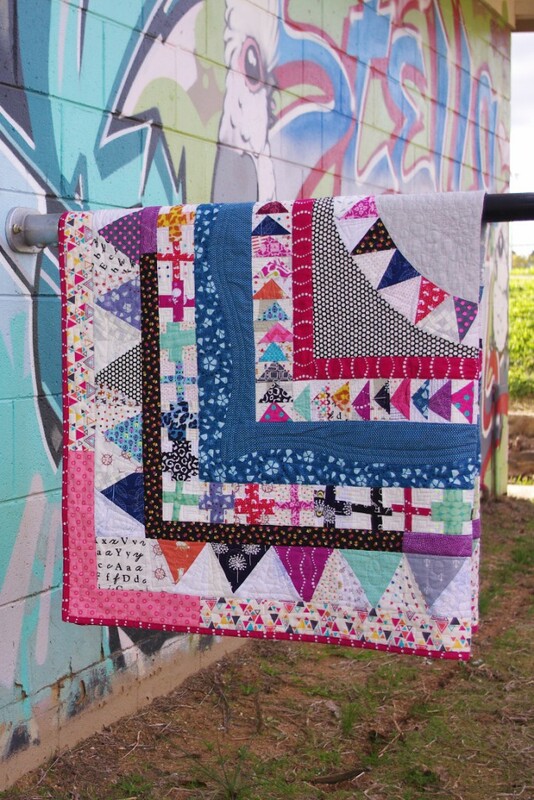 By far my favorite Medallion quilt that I’ve seen! 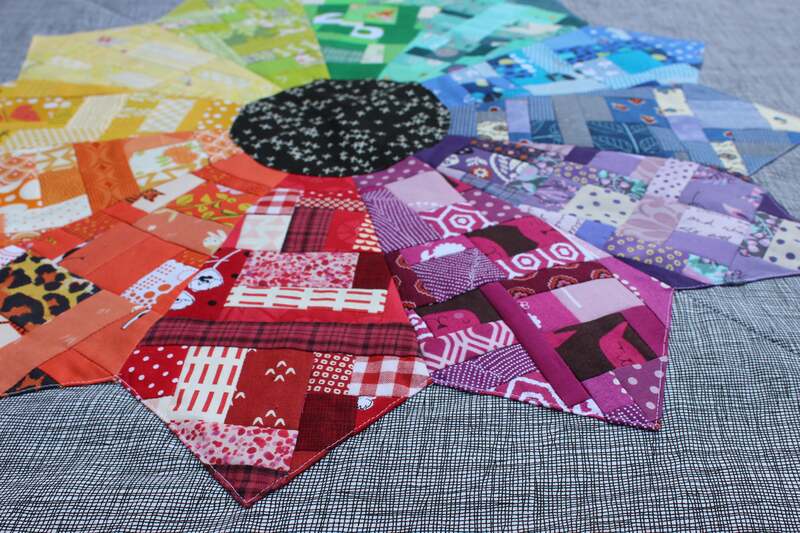 I love the idea of a New York Beauty at the centre of a Medallion quilt! This is beautiful. Hi Saw this quilt at the Modern Quilt Show in Berry couple of weekends ago. It is great. My husband who, like them al,l rolls his eyes but wouldn’t miss a show or stay out of a quilt shop, couldn’t get over this. He had not seen wonky piecing before and kept saying it is ‘just wrong!’ LOL will convert him yet. Thanks for stretching his imagination! Wow – thank you! I’m so pleased that your husband (and you) took the time to check out my quilt! Wasn’t the show great? 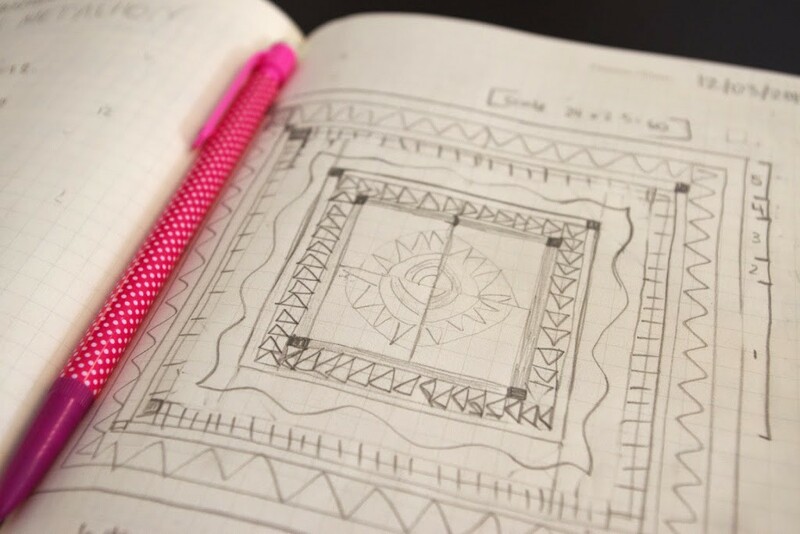 I have never made a medalllion quilt… Mm makes me want to start one! Oh I just love medallion quilts! Yours is so fun. Love the centerpiece especially! It’s beautiful! I’m excited about the pattern and the sew along. I will be back! I’m visiting from kim’s sewjo saturday. It’s gorgeous. I need to get back to working on my medallion quilt. Was that your beautiful quilt I saw today at the Texas Quilt Museum as part of their modern quilt exhibit! The medallion? YES! I sent it off last year and haven’t really heard much since, so thank you!